The VHD-PC2HN is a revolutionary product! It brings the unprecedented flexibility and performance for the PCs, home / office network and HDTV to work together for entertainment / work in a way that has never done before. The VHD-PC2HN allows you to connect PC / laptop through a wired or wireless network to put video / desktop on HDTV or VGA monitor. You can connect the PC / laptop to the VHD-PC2HN unit directly with an Ethernet cable or though a wire / wireless router. Wired connection can support CAT5e/CAT6 range up to 100m between VHD-PC2HN and the router. 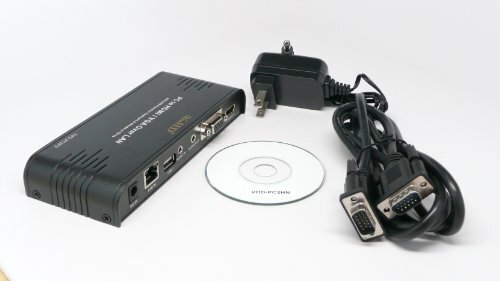 You can connect one HDTV to the VHD-PC2HN with a HDMI cable, or connect a computer monitor using the provided VGA cable. Only one physical connection is allowed, either HDMI or VGA. In the same network (sharing the same router), the single VHD-PC2HN can be used by all PCs (with software installed) on the network, but only ONE PC can have the control at any time. This is a great feature for conference / meeting; it enables different networked PCs / Laptops to use the same projector / HDTV / Monitor in sequence, without the need for disconnecting / reconnecting cables. The VHD-PC2HN has two USB ports for keyboard / mouse / USB drive connections. This allows the users to operate a remote PC and operate the HDTV / monitor for entertainment / work. For example, with this product, you can use your office PC downstairs, as long as you can have an Ethernet connection to the office PC directly or though a router, for remote application. Or it can be easily used as a PC to HDTV (up to 1080p) or monitor adapter to utilize the RJ45 Ethernet port on the PC or laptop to conveniently add another display unit to expand desktop screen space. VHD-PC2HN supports Microsoft Window XP and Window 7. It does NOT support Window Vista. For detailed operation guideline, please visit the product forum located at the bottom part of this page. Support Window XP and Window 7. Do NOT support Window Vista.